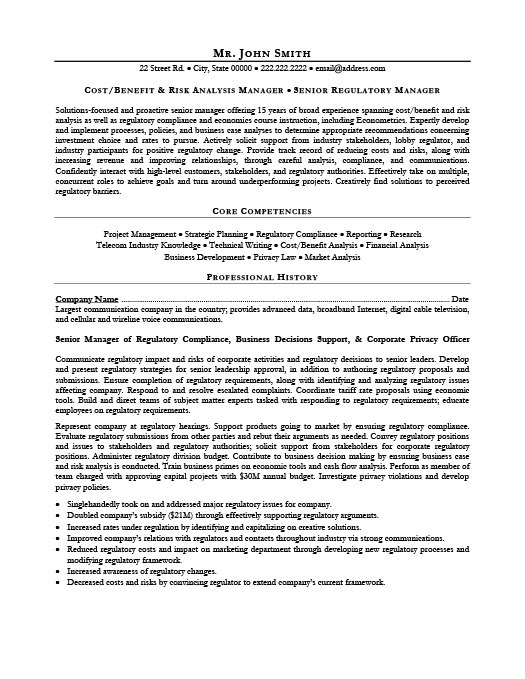 A Regional Sales Manager has to present a record of sales accomplishments and the ability to manage a branch. Getting hired for a Regional Sales Management position requires for a candidate to demonstrate working success in a corporate environment and a capability to lead a team in order to meet and exceed sales targets. Regional Sales Managers have to demonstrate to an employer that they are goal-oriented, that they have a likeable personality and an aptitude to build long-term relationships with clients and peers. 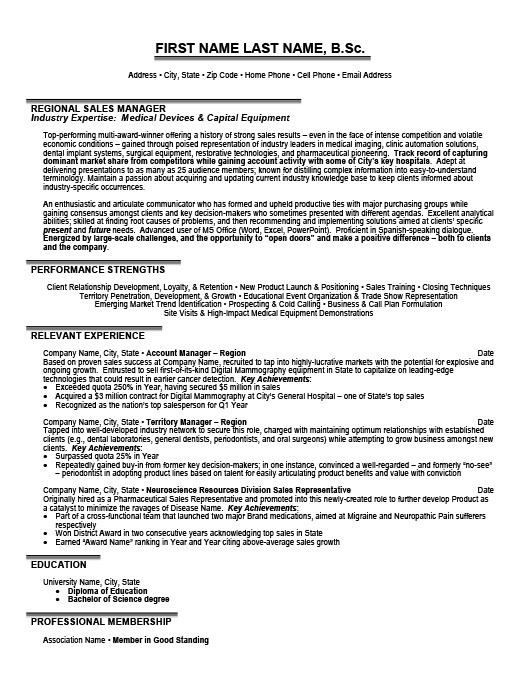 The Regional Sales Manager resume template below is split into five categories with educational credentials and professional board associations at bottom. The resume begins with an attention-grabbing value proposition: what John can accomplish for the right employer - which automatically sets him apart as a valuable commodity versus just another applicant for the position. Following this value proposition, John outlines his capabilities as a leader and demonstrates his successes in interpersonal environments to highlight his ability to build a successful team. 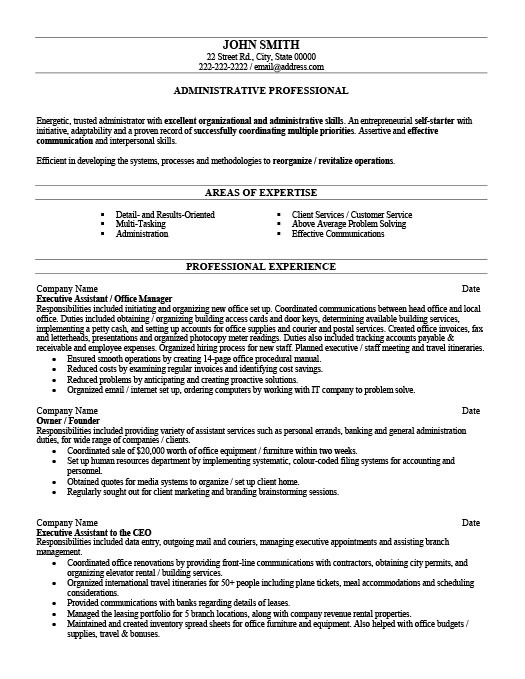 John uses a bullet-point format in the resume sample to highlight his core strengths, and finally outlines work experience in-depth to demonstrate his capability to impact a company’s bottom-line, head-on, and in a corporate environment. 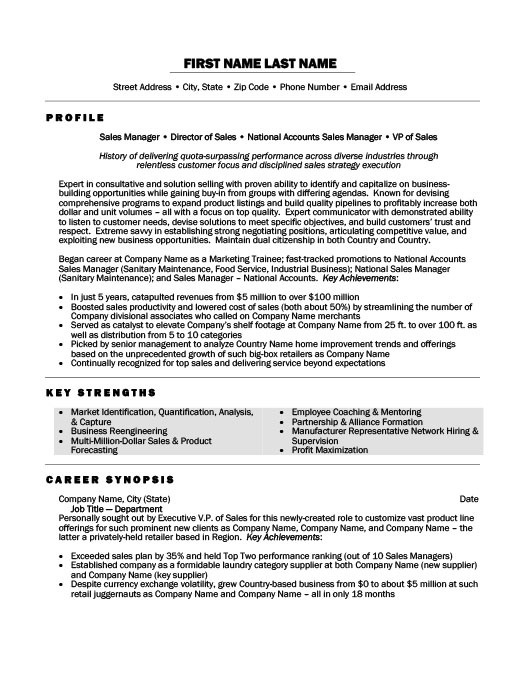 When applying for a Regional Sales Manager position, demonstrate your capabilities to work with others and form long-term relationships in your summary statement as outlined in the resume sample. Use your work history experience to back up your ability to convert prospects into revenue with attention to detail regarding quantitative results under each role.